Our new bottles are ideal for a range of purposes in both a domestic and commercial setting. All of these products are ideal for the storage and transportation of a range of liquids. Our bottles are manufactured from durable plastic materials. Our HDPE (High Density Polyethylene) bottles come in a range of sizes – 250ml, 500ml and 1l and are ideal for storing liquids in high-pressure environments on the road or in the warehouse. 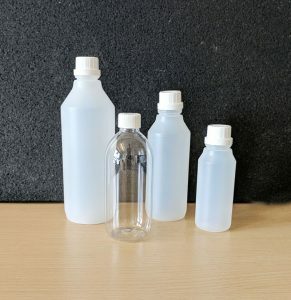 Our PET bottles are strong and crystal clear making them a great way to store liquids in a way that allows customers to view the product clearly, e.g. mineral water, juices, oils, sauces, toiletries, etc. As these items are less bulky than our usual products, we’ve endeavoured to keep our delivery costs as low as possible. If your shopping basket only contains items from our plastic bottles range (up to a limit of 50 units) then our cheaper small items delivery charges are applied instead – perfect if you’re looking to order small volumes. Over the coming weeks, we’ll be posting some more blog posts with ideas containing potential uses for our bottles. In the meantime, you can browse the whole range by clicking here. ← Storing pet food in bulk? We’ve got a plastic container for you!